On Robin Williams’ turn as a circus performer in Moscow on the Hudson. Vladimir Ivanov, a defected Moscow Circus musician played by Academy Award winning American actor Robin Williams in the 1984 comedy movie Moscow on the Hudson, is not necessarily one of Williams’ most well known movies out of the dozens he's played in, if you’re not a part of the Moscow Circus, that is. To Russians, and to me, this film will always be one of our most favorite of Williams’ flicks, and not just because the entire movie, from start to finish, is hilarious. Directed by Paul Mazursky (that sounds like a Russian last name if you ask me) and co-starring Latin hottie Maria Conchita Alonso, what makes this particular film unique – or maybe not – is that Williams’ talent as an actor and a comedian really gives you the sense that he really had to spend some serious time in the Moscow Circus, in Moscow, to train for the role. Or maybe he had some Russian blood nobody knows about, one of the Eastern European backgrounds that people talk about at backyard get-togethers when there’s really nothing else to talk about other than when your ancestors emigrated to America. From the moment when his character Ivanov is crawling around on all fours, running away from the KGB in New York’s Bloomingdales department store, Moscow on the Hudson is one laugh after another. 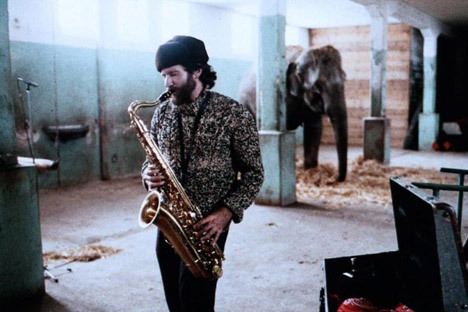 Williams plays Ivanov, a Moscow Circus musician on tour with the show, who decides impulsively to defect, and from there the movie gets funny, funnier, and well, it’s all funny. Russian performers often talk about how Americans don’t “get it,” – i.e., the Russian soul, the Russian humor, the Russian craziness, and the Russian obsession with all things circus – but Williams certainly did. I have no doubt that much of the movie’s script was left blank, so Williams could improvise his scenes with his famed funny talk, and his unique weirdness. Many Russian circus performers are still trying to make it in America. I’m sure that if they had had the opportunity to meet Williams in person – as did Russian performer Mikhail Matorin who posted his picture with Williams on Facebook yesterday, they’d have a lot to talk about, no translator needed. I love that Facebook picture. Williams looks like a really nice, down-to-earth kind of performer, not one that is known the world over, and he just looks like the kind of Hollywood guy that you’d love to have over for dinner: not snobbish, not full of himself, just out to make people laugh. Some movies you go to because the plot sounds interesting. But for those with Williams in it, I went simply to see him. He was my favorite American actor, because he just seemed to be in a world above the rest of us, and I knew that he'd always come up with funny things to say, and not because he had a speechwriter working for him. When he wasn't talking about all things Moscow Circus, my other favorite flick had him based in Vietnam. I can't tell you how many times I've watched the 1987 film Good Morning, Vietnam, another one of Williams' famed movies that garnered him an Academy Award nomination for best actor. He wasn't crawling around on the floor in this portrayal of an Army DJ in this movie. He was blasting it out over the airwaves, keeping down-and-out military troops laughing with his jokes and anecdotes. If anyone could lift the spirits of soldiers, it was Williams. Williams will be missed sorely, in Moscow, Vietnam, and right here in America.